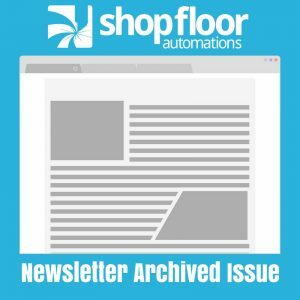 The following is an archive of the Shop Floor Automations Newsletter – July 2012. Executives, managers, and engineers are constantly looking for ways to streamline data and take control of the shop floor. There are only a few companies that provide solutions to help attain these goals. For example, monitoring and ERP/MRP are two key areas that are typically considered to be the same; however, they provide different areas of focus and results. Shop Floor Automations is able to provide you solutions for machine monitoring and ERP/MRP which will help close the gap and manage data effectively within your business system. As new CNCs with Ethernet communication are added to the shop floor, old CNCs are left behind. RS232 communication via switchboxes, PCMCIA cards or USB is not the only solution. Using our latest LAN Connect Remote device you can now send files from your office or pull them from the CNC using FTP and Ethernet. There is no software to purchase, simply attach to your existing (or provide a new) network and you are able to leverage 2GB of storage with on-board memory. Our LAN Connect Remote device is easy to install, simple to use and a great, low-cost solution to bring everything into the 21st century. Frustrated with limited support Monday – Friday and short hours? Are you leaving voice mails all day waiting for a response with other companies? SFA’s Web Callback is available 24/365. Visit our website under “Contact” to reach us ANYTIME! We have a dedicated staff of Engineers ready to respond within hours.